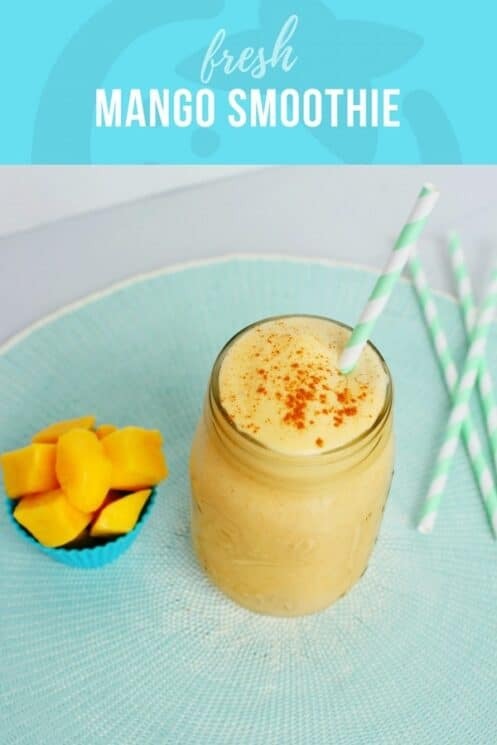 Frozen Mangoes make the best fresh tasting smoothies! Better texture. It feels more like a slushy or milkshake, rather than watered down. Better taste. Fruit is able to be frozen at the peak of ripeness, rather than buying fruit that isn’t quite ripe yet. But what we really like about using frozen mangoes is that fresh mangoes are not that easy to cut and peel! A whole mango, after cut and peeled, usually only has a small amount of flesh left! Yet frozen mangoes are ALL flesh with no cutting necessary. 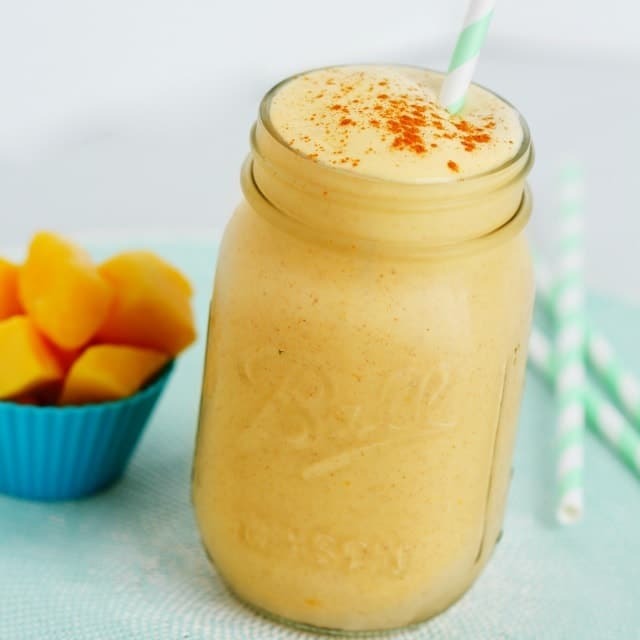 Smoothie’s aside, even when snacking we prefer frozen mangoes. The texture in the mango itself doesn’t feel stringy or mushy. Frozen mangoes are just better! Frozen fruit is also great for putting smoothie making into a simple and easy breakfast. We try to keep frozen fruit on hand, just for smoothies! Usually we’ll do it because we got a great deal on fruit.. or because we grew some. 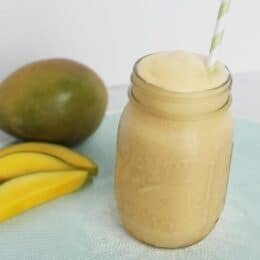 The most common fruits we freeze for easy smoothie making besides mangoes are strawberries, bananas, cherries, and peaches. We also spend some time making frozen smoothie packs. The frozen smoothie packs we make include a cube of yogurt to make the smoothie creamier. Blending 2 cups of Greek yogurt with cinnamon, honey and vanilla. Freezing the 2 yogurt into an ice cube tray. Then assembling with half the yogurt and 1 cup of mangoes in each bag! If your picky eater is hesitant about trying or eating mangoes, you’ll definitely want to start with frozen mangoes. They soon might become their favorite fruit. 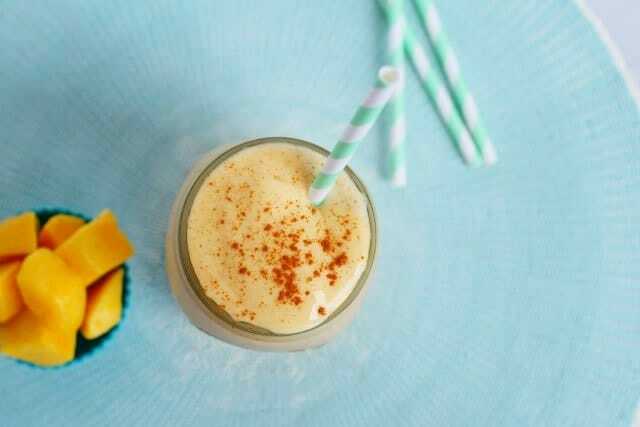 Add yogurt, cinnamon, honey, vanilla, lemon juice and finally the mango, to a blender. Mix until smooth. Serve.